The Bed Power strip is a product that is a little outside of my normal expertise, but it’s made by a mattress foundation company that I’m familiar with, Forever Foundations. It was originally an accessory to their “Store More” foundation, but they made a version which works universally. 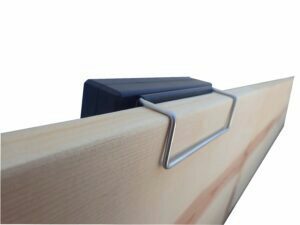 It’s an ingenious little power strip for your bed frame, to make it easier to plug in things like a bedside lamp, your cell phone, or laptop. It’s cable management for your bed. They sent me a free BedPower to review, and it’s really useful. Two AC outlets and 2 USB ports. This is enough to plug in a lamp, alarm clock, cell phone, and tablet, but not so big that it takes up a lot of room. 90 degree angle plug. 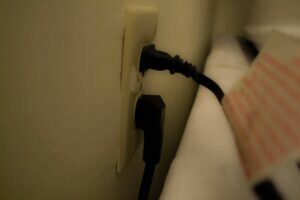 The plug stays close against the wall, with the cord coming from the bottom, so if your outlets are behind your mattress (like mine in my guest bedroom), the cord won’t be folded in half or the plug pulled out of the wall. Top: My lamp plug behind my mattress. Bottom: The angled BedPower plug. You can see the BedPower fits much more easily in the space. 8 foot cord. 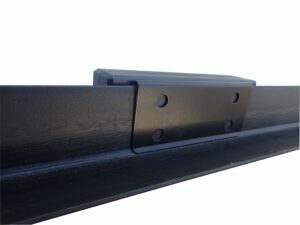 This allows it to clip where and how you want at any reasonable distance from the outlet. 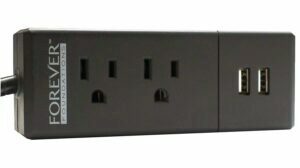 The Bed Power strip is a neat little product that I’m surprised I haven’t seen done before, because it seems so obvious in retrospect. Pretty much everybody uses cell phones, tablets, and/or laptops in bed, and this is aside from the typical bedroom lamps. Old-school power strips aren’t really designed with bedroom use in mind, and this one is. If you share the bed with someone, consider getting 2: one for each side of the bed. I feel I’d be remiss if I didn’t add in one objection: sleep experts say you shouldn’t be using cell phones or computers in the bedroom. Cell phone use before bed can make it more difficult to fall asleep. However, most people don’t follow that advice (and for the record, neither do I, even though I know it’s not good). 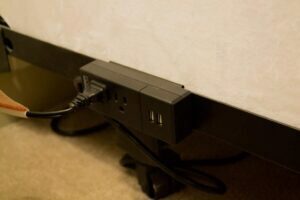 So, with that in mind, if you are going to plug in your cell phone in your bedroom, like most people do, the Bed Power strip is a good, fairly inexpensive, way to accomplish it. Click here to purchase a Bed Power strip from Amazon.